The Truckee River flows a 121 miles from Lake Tahoe to Pyramid Lake. Photo by Jon Baiocchi. Some of my fondest memories growing up were fly fishing the Truckee River in the mid 1970’s with my dad. Back then it was a rarity to see someone using a fly rod while plying the river’s currents, and when we did see such a person, my dad would make it a point to introduce himself and talk about fly fishing with a complete stranger. The fly fishing scene in the Tahoe Truckee area is much different these days, many anglers flock to test their skills on the river with a hope of catching one of the many trophy trout that reside there. Factor in nearly 30 guides working the area, and one has to wonder if it’s even worth going to the Truckee River and fishing among the crowds. Oh, it’s worth it all right, and the river rivals any of the greatest trout fisheries found in the western United States. Long ago before modern man made his presence known on the banks of the Truckee River, there were giant Lahontan Cutthroat trout that swam upstream from Pyramid Lake towards Lake Tahoe to spawn. Poor stewardship by early settlers combined with the pollution of sawmills, and over harvesting of the resource, led to the demise of the native 40 pound cutthroat trout. Today the Truckee has an incredibly healthy population of beautiful wild brown and rainbow trout. 10 percent of the anglers catch 90 percent of the fish on the Truckee River is a truism, it’s not easy, and it takes many hours on the water to master. From the outflow of Lake Tahoe to the town of Truckee, the river receives plants of hatchery fish, and is used by multi recreationalists that swim, raft and tube the river in the warmer months. Regulations in this section state the season opens the last Saturday of April to November 15th, with a daily limit of 5 fish, 10 in possession. Just downstream of the town of Truckee, starting at Trout Creek to the California / Nevada border, special “wild trout” regulations are in place, and the river is open year round and only barbless artificial flies may be used. Two fish may be kept between the last Saturday of April, to November 15th, with a minimum size of 14 inches. You would be hard pressed to find a fly angler willing to harvest a fish that is not planted in the Truckee River, the wild trout that reside here are extremely special, and catch and release practices ensures the population will continue for the future. As the Truckee River flows downstream from the confluence of Trout Creek, its character includes pocket water mixed with large boulders, pools, riffles, and runs. Glenshire Drive parallels the river and an angler can gain access from several large parking areas along the way. Well known runs like “Truckee Falls”, “Cat House Hole”, “The Toilet Bowl”, and “The Glenshire Bridge” are within easy walking distance from parking areas. From the Glenshire Bridge down to Interstate 80 is private water owned and operated by the San Francisco Fly Casting Club and is patrolled on a daily basis. 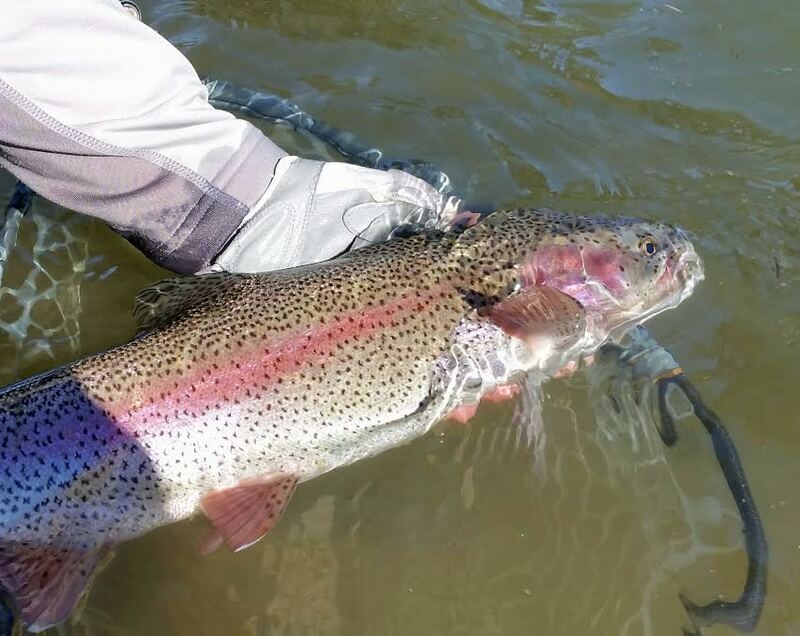 The SFFCC club plants brood stock rainbows from a private hatchery in their section of the river, and those fish often migrate upstream and downstream from the club. The stocked trout can be easily identified by having squared off tails (the results of being raised in a hatchery), less vibrant color, and more eagerness to take artificial flies than the wild trout of the Truckee River. There is a short section of river from where it first meets Interstate 80 downstream to where it crosses the Interstate a second time. In this section you will find the confluence of Prosser Creek which flows a short distance below Prosser dam to the Truckee River. Access is only found by parking off the westbound lanes of Interstate 80 in an unmarked large dirt parking lot. Anglers will be ticketed by the California Highway Patrol if parked to close to the Interstate, or in marked “No Parking” areas. The Truckee River in this section is much like the Glenshire stretch with shorter runs in the steeper gradient areas. The river then flows in a big 180 degree loop that has a famous section called “Horner’s Corner”, which is named after long time fly angler Jack Horner, one of the most innovative fly tiers on the west coast. It was Jack who invented the “Humpy” dry fly, which is still an effective fly today as it was some 60 years ago. Access here is only possible off the eastbound lanes of the I-80 after crossing the second bridge. “The Loop” as referred to by the locals, will be receiving a major restoration effort for 2017 with improved habitat in the form of logs and boulders that will be strategically placed by Truckee Trout Unlimited Chapter #103. The improvements will bring more favorable conditions for both wild trout and anglers alike. The Truckee river crosses Interstate 80 a third time where it cascades down through succulent pocket water and comes to rest briefly in a very large pool near the Little Truckee River confluence. Depending on the time of year, the outflow of the Little Truckee River below Boca Reservoir can add a substantial amount of water, and / or turbidity during winter, and from the spring runoff of the melting snowpack. From “The Junction” downstream, the river passes under the old historic Boca Bridge, and crosses the I-80 a fourth time, flowing down to the small town of Hirschdale. The gradient steepens here a little more and with the added water from Boca Reservoir, the river is much swifter and widens in size. There is not as much pocket water in this section and the runs become longer in size. Access is only available underneath and near the I-80 Bridge and working upstream from the Hirschdale Bridge. From Hirschdale to the California / Nevada border, the river enters “The Grand Canyon of the Truckee River”, and though access is very limited and hard to get to, this section produces large trout that are measured in pounds, not inches. Everything is magnified in the canyon when it comes to water structure, bigger pockets, pools, riffles, and runs. The flora changes as well and the northern Nevada desert encroaches the further one fishes downstream. An angler will have a bit more solitude in the canyon, especially if one is willing to hike a greater distance. This section of the Truckee River is my absolute favorite. Access can be found along the Hirschdale road, and a few wide pullouts along the I-80, and at the Farad and Floriston areas. 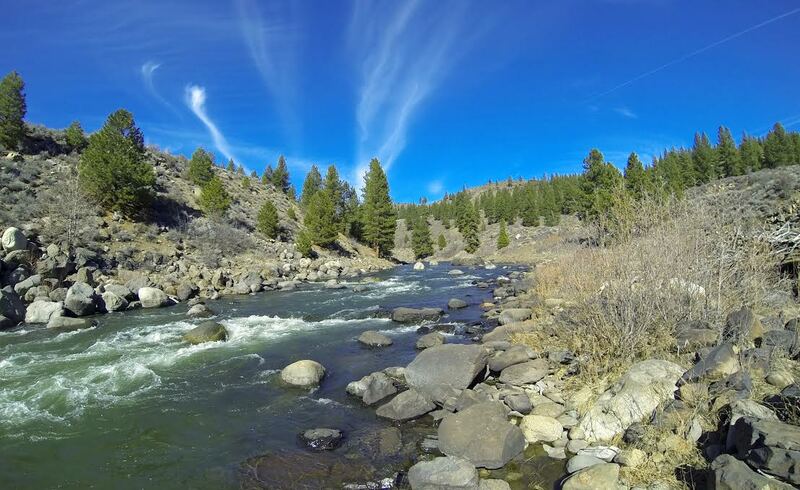 The Truckee River continues into the state of Nevada, where good fishing can be found down to the town of Reno, keep in mind that a Nevada fishing license is required here, and regulations must be adhered to by the Nevada Department of Wildlife. Every season on the Truckee River requires different tactics and techniques to be successful, even where the trout like to call home changes dramatically from winter to summer. One element is for certain, and that is subsurface presentations is going to get the job done every time. Water temperatures will dictate how good the fishing is to be expected, the prime temperatures are 56 to 63 degrees. Another aspect is that 20% of the water holds 80% of the fish, and reading water effectively is just as important as technique and fly selection. Rod selection should be a 9 foot, 5 to 6 weight rod, and a 7 weight for casting large heavy streamers. Floating weight forward lines are used about 90% of the time, and sink tip fly lines are mostly used with streamer set ups during periods of high water. The regulation changes that were passed eight years ago now keep the Truckee River open during the winter. An angler can now fish all four seasons as they chase the sun, and the hatches throughout the year. Winter conditions bring colder water temps, and the wild trout will not move a great distance to consume your fly, therefor, an angler must present their fly right on the nose of a willing trout. Strikes will also be less aggressive and hard to decipher. Winter trout will take residence in slower moving water near the tail out of a run with a moderate depth. The time of day is critical though, and an angler should choose the warmest part of the day, which occurs in the afternoon. A rise in water temperatures by one or two degrees is enough to spur a hatch, where upon a lethargic trout will become more active to feed. During this time of year the populations of trout are more concentrated together, and the fish will be podded up. Larger trophy trout are usually loners and will occupy their own territorial areas. Tight line or indicator nymphing, and using streamers that imitate sculpins are the go to techniques. On a warmer day that includes clouds, you may have a brief window of dry fly fishing when a hatch of midges, or little winter stoneflies occur. Big water events like what we have experienced for the 2017 season can blow out the Truckee River for up to a week or longer, especially when precipitation falls on top of a large snowpack. When these events take place, it is still possible to fish the river as the majority of the trout will be found on the side water where there is a reduction of the flow, and softer water. Access can be problem during winter, and with a deep snowpack, parking is very limited. A good game plan is to arrive early to secure your parking spot, then waiting on the banks of the river until the air temperatures warm up enough to ensure a more productive session. The other is to be dropped off at a certain location by a friend, or your significant other. You may need snowshoes to reach the river, and wearing rubber soled boots will defer from snow clumping up as when using felt soled boots. Basic skills in navigating snow country will be of great value including clothing, and equipment choices that will make your day an enjoyable one. Spring time is a bit of a gamble in the Sierra for fly fishing. There is a small window just before the runoff commences. The days are longer, and trout are beginning to feed more as aquatic insect hatches increase, and water temperatures rise. The best case scenario is a slow thaw where the slightly increased flows occur during the late afternoon into the night, and quickly subside from the cold freeze after midnight, making for favorable conditions in the morning during the following day. Big warm ups of air temperatures in spring bring extreme melting conditions of the snowpack which produces unfishable flows that are turbid and cold. Dead drift nymphing whether by high sticking or indicator rigs will offer the best results. There may be some dry fly opportunities in the softer water depending on the intensity of the hatches, especially in the warmer afternoons when skwala stoneflies or blue wing olive mayflies will be active. Access will be somewhat more available unlike winter, but keep in mind that it will be mud season, and common sense will keep you and your vehicle from getting stuck on soft shoulders and parking lots. The spring season in the Sierra is an amazing time as native grasses return to a glorious green color, songbirds return with courtship calls, and the landscape makes dramatic changes as life begins again after taking a subdued break from the winter season. Once the bulk of the runoff subsides and the Truckee River moves into the late spring and summer rhythms, some of the best fishing of the year takes place. In the month of June, three dominant hatches occur starting with the winged Carpenter ant. This hatch is very short lived and usually lasts about a week depending on air temperatures. At times there may be swarms during the nuptial flight of males and females when warm humid conditions occur. 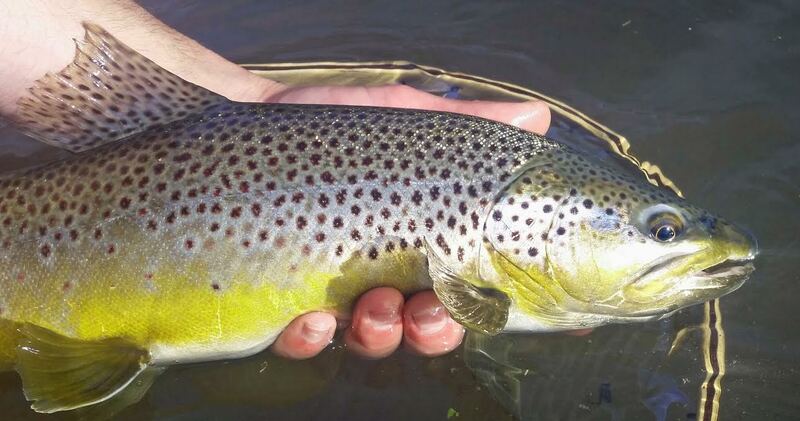 The trout will still take surface patterns for another week after the hatch has ended because it is a substantial meal they recognize, and simply can’t pass up. Following the Carpenter ants, the Golden stoneflies, and the Green Drake mayflies make their appearance. Both aquatic insects are rather large and provide the fish with a prime rib dinner whether it is subsurface, or riding the surface of the river’s currents. During this time of year, a wise angler will carry two rods, one rigged with a nymphing setup, and the other with a dry fly. Carrying two rods saves the angler valuable time from switching from one rig to another. The evening rise should not be missed as the river can come alive during the last two hours of light with Caddis hatches. It may be necessary to scout sections of the river until visible signs of rising trout can be found. Once identified, it’s best to carefully and methodically fish to active feeding trout for the best success. Crowds increase due to the fantastic weather that blankets the land, so finding a good spot on the river comes down to staking your area of choice by being on the water in the early morning, or scanning the river with binoculars and looking for open runs before venturing down. The behavior of the trout is much different now than in the winter season, the fish will be more spread out in a variety of different water structures. The successful angler will concentrate their efforts on all types of water no matter the rig employed. When the fishing is slow, the angler moves fast and vice versa, when the fishing is fast, the angler moves slowly. When the dog days of the summer season commence on the Truckee River, it’s even more important to be on the water at first light for a number of reasons. Most importantly are water temperatures will be cooler at this time. The trout will be normally found in the tail outs of runs during the morning hours, and as the water temperatures increase, they will head upstream into riffles that have whitewater. As water temperatures increase there is less oxygen, however, bubbly frothy water provides more oxygen and the fish will be more comfortable and be able to survive. During the summer months there is a voluntary “Hoot Owl” closure of the Truckee River, an unwritten rule among fly anglers that suggest to stop fishing once the water temperatures reach 68 degrees and higher. Trout that are caught and played during these conditions are more susceptible to a higher mortality rate. Carrying a thermometer and taking readings every hour will provide an angler with the necessary data for current water temperatures, and knowing when to stop fishing. This usually occurs somewhere around noon time. Many local fly anglers during the heat of the summer will focus their fishing where cooler water can be found at higher alpine lakes, tail waters, or will target bass in nearby Stampede and Prosser Reservoirs. When the fall season arrives, the second season begins. Water temperatures come down into safer conditions for fishing, the hatches increase, and the lower arc of the sun reminds the trout that winter is coming which increases feeding behavior. With the kids back in school, there tends to be less pressure on the water, especially on the weekdays. Caddis hatches continue to be the most dominant bug, along with terrestrials like grasshoppers and ants. Lower water levels will concentrate the fish in the more prominent runs and pools, or other areas that have sufficient depth of holding water. A great tactic and rig for this time of year is the hopper dropper setup which entails using a buoyant grasshopper pattern, with 18” of tippet trailing off the hook to a small flashy mayfly or caddis nymph below. The crayfish that inhabit the Truckee River will be molting during the late summer and early fall, and the wild trout are more apt to eating them with their softer exoskeleton. Using streamer tactics by swinging or dead drift high sticking with a crayfish pattern is very effective and should not be overlooked. When the fall season reaches the middle of October the blaze of autumn colors in the Truckee area is a must experience. The last major aquatic insect emerges during this time, the October caddis, which is the largest caddis in all of North America. These burnt orange colored bugs have gray wings, and are most active during the warmest time of the day on sunny sections of the river. Look for females ovipositing on the water’s surface laying their eggs, where often they are caught in the water’s meniscus layer and are stuck, making an easy high calorie meal for a trout. The October caddis lives for a few months which is a long time for an aquatic insect, or until the first hard freeze hits the region. More than a Blue Ribbon fishery, the Truckee River offers one of the best fly fishing experiences in the entire west, and redefines the meaning of a true Sierra freestone river. Though its headwaters may be surrounded by large populations of busy recreational tourist, its true beauty shines when you’re alone with the mountain sun reflecting off the swirling water, and the wild trout shimmer like the finest of jewels in your hand. A renegade force of nature, the Truckee River answers to no one as it flows with no emotion, often humbling and rewarding fly anglers along its course, until it reaches the great sea of the northern Nevada desert. Below I have categorized the most effective flies as nymphs, streamers, and dry flies. These flies are proven patterns over decades that have a winning track record, with some created by local individuals and guides, specifically for the Truckee River. Copper John #14-18 (copper, red purple). X-May #16-20 (black, olive, red). Jimmy Legs Stone #6-10 (black, brown, yellow/brown). Slump Buster #2-8 (olive, burnt orange). Bunny Leech #4-8 (black, purple, white, olive). Sparkle Dun #14-20 (bwo, pmd, green drake). Hackle Stacker #14-18 (bwo, pmd). Crystal Rubber Leg Stimulator #8-16 (yellow, orange). E/C Caddis #12-18 (amber, gray, yellow, olive). -Granite Flat Campground, Truckee River, USFS. -Goose Meadow Campground, Truckee River, USFS. -Silver Creek Campground, Truckee River, USFS. -Boca Campground, Boca Reservoir, USFS. -Boca Springs Campground, near Boca Reservoir, USFS. -Boyington Mill Campground, Little Truckee River, USFS. 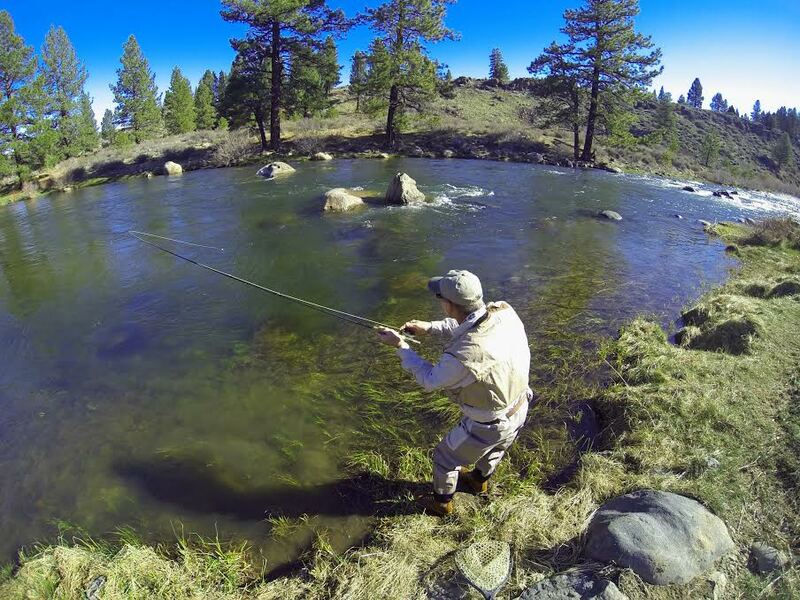 A wild trout fishery best describes the Truckee River and is very challenging to master. Photo by Jon Baiocchi. The canyon section of the Truckee River is known for the big brown trout population. Photo by Jon Baiocchi. Paul Hedji hooked up to a large brown trout near the Glenshire area. Photo by Jon Baiocchi.